Sticking sax pads are a real nuisance. Usually it’s the pads that open that give the most trouble, e.g. G#, Eb, low C#, and any of the upper stack palm keys. Pads that close can sometimes offer the same annoying behavior, though not nearly to the degree as their opening counterparts. Some pad types are more prone to stick than others. 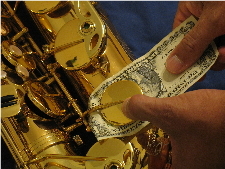 Whether a pad is natural or synthetic, variances from one manufacturer to another, or the player’s saliva all factor in to a sax pad’s tendency to adhere. Prevention is the best way to avoid this trouble. 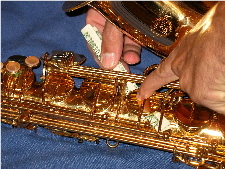 Swabbing after EVERY time you play your sax is the number one preventive measure you can take. The other is to not eat or drink before playing. If you do, brush your teeth or at the very least rinse your mouth with water. But sooner or later, every player will have to deal with the errant pad(s) that will insist on uncooperation. In an effort to unstick a pad, the player often resorts to drying it. Some players will apply a layer of baby powder—which is really talcum powder—on the pad. Yes, this will absorb moisture, but it won’t take it away from the pad or tone hole. In fact, it will just leave a messy goop. Players who do this will apply the talcum powder, let it sit for awhile, and then wipe it off the pad claiming that this action does remove the “goop” from the pad…most of it anyway. Another practice players do to solve sticking pads is to apply rubbing alcohol to the pad with a Q-tip. This will certainly dry the pad out to be sure. It will dry it out to the point of dry-rotting the pad. The pad will become hard and then crack. Pads should have SOME moisture in them in order to remain flexible enough to form a seal around the tone hole. Alcohol is a very hard chemical, and is destructive to your pad. The short term fix is to strip off the sticking agent from the pad and tone hole with paper currency. Most paper currencies of the world possess at least some fabric in their content. (U.S. dollars are made of cotton fiber paper, as opposed to wood fiber paper.) The newer and firmer the bill, the better it will work. Use a dollar bill, or as low a denomination as possible, in case it rips during the process! Fold the note as many times as necessary so as to pass through any posts, rods, or key guards. Be careful of springs; some could give you a nasty cut. Slip it under the pad. Press the tone cup closed and pull the dollar out. Use enough pressure to be effective, but not too much to cause a tear in your money. Repeat this procedure a number of times in order to cover the entire circumference of the pad. No pad is going to last forever. At some point in time, a repad is going to be needed. Some pads have longer lives than others, so under normal circumstances a complete repad may not be required. When is a saxophone repad necessary? Or when do individual pads need to replaced? Here are the symptoms of a dead pad: 1. Continual leaks when playing. 2. Pad is hard, and no longer flexible. 3. Pad is ripped or torn. 4. The pad is dark green even after cleaning. This is only a temporary fix, and in some cases I’ve had to do it during a rehearsal and performance. Not my choice to do so, but it works in an emergency.